The Divided We Fall launch photo. My materials for the Divided We Fall launch. 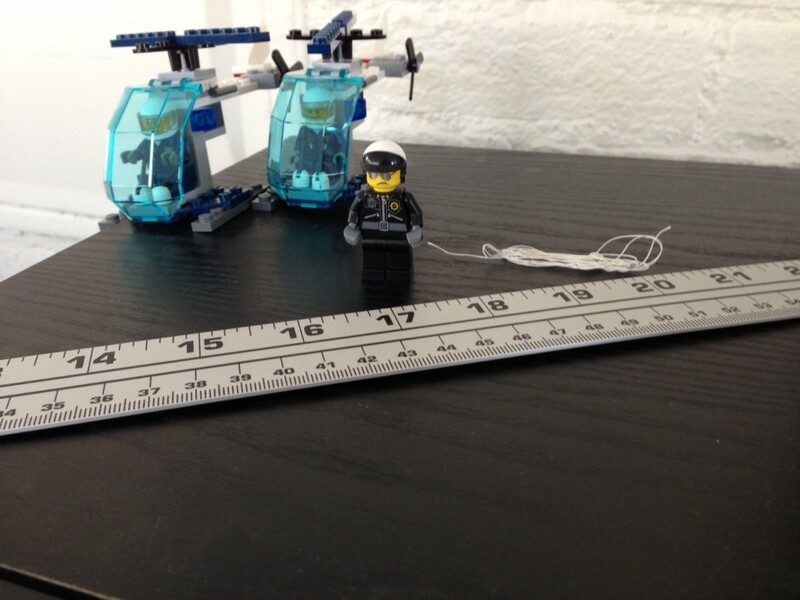 My first LEGO book launch secret is that my approach is not at all high-tech. I take most of my photos with the iPhone 5 camera. Occasionally I use a subcompact Panasonic Lumix point-and-shoot if I have to shoot in a tight space. I would love to have a DLSR camera with a macro lens for toy photography, but I don’t have that kind of money. Writers are like athletes. A few make a ton of money, but most toil in obscurity, barely getting by and with careers that are woefully short due to injury (athletes) or a combination of burnout and changing market conditions (writers). I also improvise with equipment. I used thread to hold the helicopters aloft and matched its color to my background so it wouldn’t be visible in the photo. I tied the thread to a flexible yardstick that I’ve carried with me since my undergraduate days when I considered majoring in architecture. While shooting with one hand, I held up the yardstick and bounced it a little, thus conveying the sense of movement as the helicopters hovered over Little Brick Township and Trent’s military veteran hero frowned. Trent’s novel is a dystopian thriller set close to the present day. However, I’ve launched books in other genres. 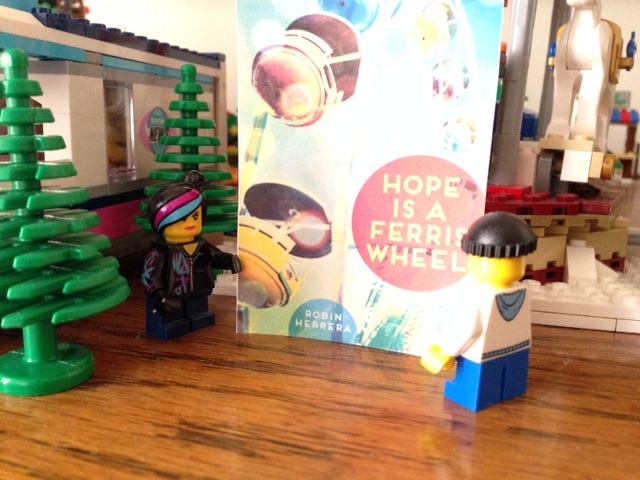 Robin Herrera’s Hope Is a Ferris Wheel is a contemporary realistic middle grade novel about a girl living in a mobile home whose flaky family and dyed hair has made her a source of derision at her school. Through her love of poetry, she connects with other classmates, though not with the class bully who appears in this set-up. 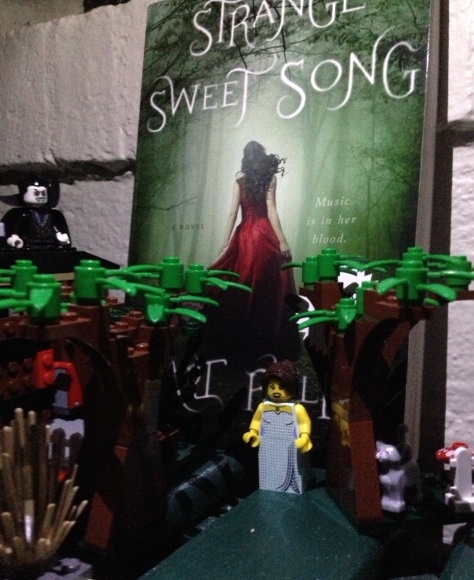 A vampire and a diva roll out Strange Sweet Song. Fantasy themes of all kinds are favorites of LEGO fans, and they are also ideal for book launches in that genre. Leaving aside licensed LEGO products, which I cannot use for books that aren’t part of that licensed theme (such as Star Wars). there are still many sets and minifigures that work well. This is apparent for my launch of Adi Rule’s Strange Sweet Song, a young adult paranormal about a 17-year-old vocal prodigy at a boarding school for gifted musicians. She has been warned not to wander off campus, but she cannot keep away from the woods on the other side of the fence — nor can she keep away from the young assistant teacher who seems to have a dark past. Karlijn’s father receives a postcard. 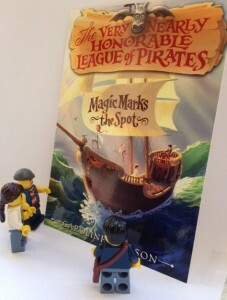 On a lighter note, I incorporated the first volume of Caroline Carlson’s The Very Nearly Honorable League of Pirates fantasy series, Magic Marks the Spot, into a story involving some of my principal Little Brick Township characters. More on this later, but Patricio’s ex-girlfriend, Karlijn, mysteriously disappeared, and he and Karlijn’s father set off to find her. After a series of misadventures in Amsterdam and Paris, they arrived home to find a postcard from the wayward Karlijn, who decided to join Hilary Westfield and her merry band of buccaneers. 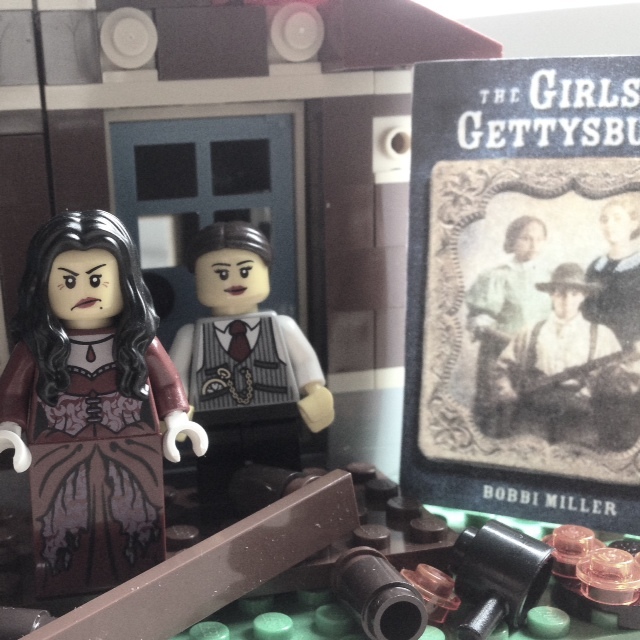 Although I don’t have any historically-themed LEGO pieces (I expect to have some castles soon), my minifigures launched a work of historical fiction, Bobbi Miller’s Girls of Gettysburg. Because I had no soldiers (the soldiers from the Lone Ranger set would have been ideal, but it was a licensed set and was also quickly discontinued after the movie bombed), Bobbi and I settled on a scene in the aftermath of the soldiers’ arrival, as the women contemplated the damage that they caused. I also edited this picture to give it an old-fashioned feel without making it completely sepia-toned as were the photographs from that era. I’m looking forward to more book launches in the fall while getting ready to launch my own Surviving Santiago next spring. I just bought a new LEGO motorcycle helmet and leather jacket in preparation! The Girls of Gettysburg are none too happy about the soldiers marching in and trampling their fence and fire. These are fabulous, Lyn! And so great to see them gathered in one gallery viewing!! I’m glad you like them. And I can’t wait to present your book launch in Lego! These are so cool and creative and fun! Thank you, Stacy! And if you’re ever interested, the Friends sets have a variety of animals that I can use. Please let me know. Oh, Lyn! I love all of these!! 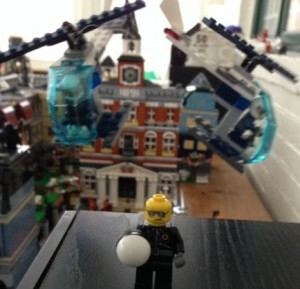 (I also love the fact that you have characters from The Lego Movie.) Such a great way to feature books! Thank you, Linda! 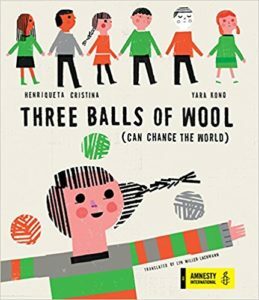 Wyldstyle turned out to be perfect for Robin Herrera’s book. And this weekend I found a pair of horses on the LEGO Store Pick-a-Brick Wall (they almost never have horses!) to turn two Bad Cops into mounted police.